Stretch cord retainers: holds/retains towels, life jackets, water bottles, etc. 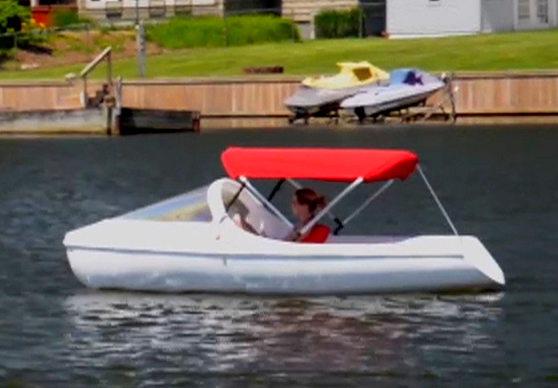 This pedal powered vessel, with its sleek design, is suitable for use in harbors, bays, ocean inlets and lakes. It is also used for transportation to an offshore yacht or island home. The boat’s efficient Nauticraft designed single pedal drive system turns a 15″ propeller, making movement through water feel effortless, reaching speeds up to 4 mph. A spade type rudder provides easy and effective turning capability, controlled by side mounted steering handles. The sailboat type hull positions the operator down inside the cockpit. Features a dry shelf up front for items you don’t want to get wet and a stretch cord retaining system around the front perimeter of the cockpit keeps life jackets, towels, emergency paddle and even a beverage safely tucked away. A rear bench seat fits 1 to 2 people with a molded-in storage compartment beneath the seat cushion. Guinness World Record holder for the English channel crossing in May of 2002. The High Windshield/Arch model is designed to deflect winds and spray in the off season or on cooler days. The windshield, made of a high impact polycarbonate material, protects the pedaler on cold weather excursions. On warm days, the windshield can be easily removed to allow cooling breezes to flow through the cockpit. The Low Windshield Escapade provides all of the features of the High Windshield model but gives a “top down” feeling of open air pedaling. See all the fun owners of our boats are having. One owner of an Escapade loves his boat so much, he started a forum to share his experience with others (and others have joined to share how much they love their Escapade boats as well). *We do not run the forum nor monitor it for accuracy. Speed Potential 3.5 – 4 mph. Price does not include shipping and handling fees. View our How To Maintain videos for the Escapade. Accessories are add-ons to enhance your experience with our pedal boats. Download our full Accessories Brochure. 4.6 out of 5 based on 18 user ratings.